A Byron Scott personal appearance, Byron Scott speaking engagement, or Byron Scott endorsement will reflect well on your company. To hire Byron Scott now for any corporate appearance, fundraiser, motivational speaker event, personal appearance, autograph signing, or website endorsement please contact our celebrity agents at 1-877-6-SPORTS. We will contact Byron Scott or contact Byron Scott's agent and provide you with the booking fees and availability immediately upon your request. Direct Sportslink is the only sports speakers bureau and talent booking agency based in the United States securing only sports talent for corporations, associations, and organizations for motivational speaking engagements, personal appearances, and endorsements. We are the premier sports celebrity booking agency and a sports celebrity procurement expert. Accordingly, we will provide you with any relevant Byron Scott website information and booking agent details so that you can hire Byron Scott for your next event. 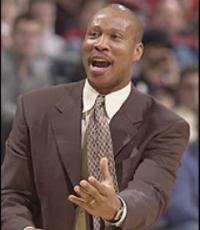 Byron Scott began his coaching career after 14 years as a player in the NBA with Los Angeles (1983-93, 1996-97), Indiana (1993-95) and Vancouver (1995-96). Scott, who holds career averages of 14.1 points, 2.8 rebounds and 2.5 assists, won three NBA championships (1985, 1987, 1988) as a key member of the Lakers' "Showtime" era. He experienced only two losing seasons as a player and his teams qualified for the playoffs in 13 of his 14 seasons. His best season came during the Lakers' 1988 championship run, when he averaged 21.7 points, 4.1 rebounds and 4.1 assists. After spending his 14th and final NBA season with the Lakers, Scott played one season in Greece for Pananthinaikos, where he led the team to the championship. After retiring from professional basketball, Scott began coaching as an assitant with the Sacramento Kings. In 2000, Scott took over the head coaching position for the New Jersey Nets where he lead them to two NBA finals in four years. He then became the head coach for the New Orleans Hornets for the next five years. In 2010, the Cleveland Cavaliers hired Scott as the head coach, a job he kept for three years. Based on your interest in Byron Scott as a speaker or for a personal appearance, Direct Sportslink has provided you additional links below for other sports talent with similar appearance fees, speaker topics, and categories that match Byron Scott.